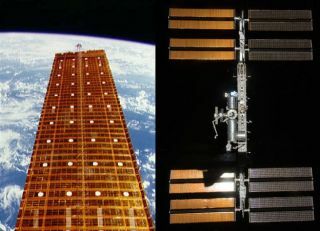 Then and now: the solar array deployed on STS-41D (left) in 1984 was the precursor to the International Space Station's wings (right) as seen in 2009. As spaceshuttle Discovery neared the International Space Station (ISS) on Sundayevening, its crew first caught sight of the sun's glare bouncing off eightpairs of solar arrays. The reflection spanned both space and time,as it hearkened back to Discovery's maiden launch 25 years ago on a six-day missionthen to test fly a large, lightweight solar wing. Guided in by STS-128 commander Rick Sturckow and hiscrew of six, Discovery docked with the ISS at 8:54 p.m. EDT, just over ahalf day and quarter century after their spacecraft's first launch at 8:41 a.m.EDT on Aug. 30, 1984. Their evening arrival also marked the 30th time anorbiter visited the still-growing station. For the members of Discovery's first crew, seeing "their" spacecraftstill flying on its silveranniversary is a sight to relish. "I'm very pleased with that," reflected STS-41D mission commanderHenry "Hank" Hartsfield in an interview with collectSPACE.com. "I'mvery glad to see that orbiter lasting." Discovery was NASA's third space shuttle orbiter to enter service, followingColumbia and Challenger in 1981 and 1983 respectively. It is now the oldestsurviving and most flown vehicle among the five-orbiter fleet after the loss inflight of its two predecessors. "I flew Columbia, Challenger, and Discovery," Hartsfield shared. "I was fortunate to be the commander of the first flight of Discovery, andit?s turned out to be a pretty doggoned good bird. We had a few problems onthat first flight but it's survived that and other things we had to fix alongthe way. The other two are lost so you know, I have but one left." Challengerbroke apart 73 seconds into its 10th launch on Jan. 28, 1986 as a result of asolid rocket booster's failed seal. Among the seven people lost that day wasJudith Resnik, who flew as a member of Hartsfield'screw on the STS-41D mission. Columbiawas lost during reentry into Earth's atmosphere on Feb. 1, 2003, 16 daysafter an impact it suffered during ascent compromised its left wing's leadingedge. "It's hard to believe she's the grand dame of the fleet," wroteSTS-41D mission specialist Richard "Mike" Mullanein an e-mail to collectSPACE.com. "I'll hope to watch from my backyard tosee her coming over on (or near) my launch anniversary and when I [do] I'll bewishing I was aboard." Discovery, now flying its 37th mission, is delivering new science experimentsand equipment to the spacestation, as well as completing the last crew rotation between the shuttleand ISS. Its history is rich with other firsts and lasts for NASA. "I remember some of the remarkable achievements that Discovery hasenabled, such as taking the Hubble Space Telescope and the Ulysses spacecraftto orbit in 1990," recounted STS-41D crewmate Steve Hawley. "Discovery also carried the first cosmonaut on a shuttle flight helpingbegin our in-space cooperation with Russia that continues to this day." "It was very rewarding and satisfying to be able to fly the first flightof a new vehicle," recalled Michael Coats, who served as Discovery's firstpilot and today leads NASA's Johnson Space Center in Texas as its director. Coats spoke to collectSPACE.com just after stormy weather hadscrubbed his chance to see Discovery launch on its current mission. He returnedto Houston before Discovery ultimately lifted off four days later on Friday,Aug. 28. "Everylaunch is a thrill obviously, but believe it or not, it's actually much moredifficult to watch a launch than it is to ride through one. Every timeDiscovery flies it is kind of a special feeling since I not only flew the firstflight but I flew it on all three of my missions. I guess the primary feeling Ihave is that I can't believe it has been 25 years. It seemed like it was justyesterday," said Coats. Discovery's maiden mission included the deployment of three satellites and a100-foot solar array, the latter the precursor to the panels that now provideelectricity for the ISS. The mission also marked the introduction of several new shuttle systems andconfigurations. "There were some major changes to [Discovery]. It didn't have tiles on itssides. It was the first to have thermal blankets [instead]," describedHartsfield. "Of course, they made that modification to the [water] dumpnozzle, which is what gave us that problem with the icicle." Instead of spraying harmlessly into space as intended, the crew's ejectedwastewater clung to Discovery's side, creating a several foot-long iceformation. Hartsfield used the orbiter's robotic arm to knock the icicle free,earning him and his crew the nickname "Icebusters". Despitethat and other problems, including the first on-pad abort, Discovery's firstcrew still takes pride in its flight. "I think it was a good machine," said Hartsfield. "Every time any other crew flew it, as soon as they got back, I said 'Ihope you didn't break my orbiter here,' said Coats. "You feel kind of possessive." After STS-128 lands, NASA plans just two more flights of Discovery out of thesix missions remaining for the space shuttle program. "Someday (too soon) she'll be in a museum and I know I'll get a lump in mythroat when I visit her," shared Mullane. For Charlie Walker, whose flight on the STS-41D mission was the first for anindustry-chosen payload specialist, Discovery's current flight underscores thepotential of the U.S. space program. "Seeing and knowing a spaceship, having flown and lived aboard her is aspecial experience. Seeing Discovery fly back to space for her 37th time makesme believe that this country can do almost anything it wants to do." Follow Discovery's 37thmission withcollectSPACE.com's STS-128 Flight Day Journal.